Basil Kostaras loses his stick in the offensive zone. 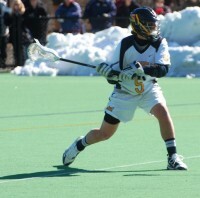 Pat Mulligan breaking into the offensive zone with defenders at his back. 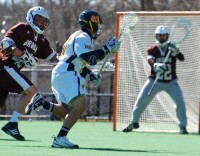 Chris Coppolecchia and Greg Pendergast defend the zone against a Brown attack. 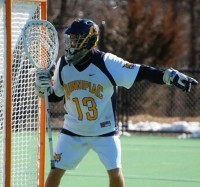 Tom Gilligan adjusts his positioning after an offensive zone turnover. Michael Sagl sets up a shot on net. Jay Binkowski out runs defenders while keeping his eyes on the net. Brandon Kuring pushing into the offensive zone. Dylan Torey gives command to better defend the goal from Brown. Grant Marston provides support against Brown offense. Chris Coppelecchia trips him and Brown forward up in an attempt to break up opposition. Basil Kostaras moves into attacking position against Brown defenders. Jay Binkowski loses his stick after a defenseman on Brown breaks up the attack. 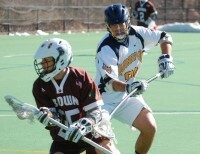 QU Defenseman, Chris Coppolecchia, prevents the progression of play from Brown.